Now is the time to save at Budget Blinds of the North Island. They’re having a scratch-and-save sale this July that can earn you 25-40% off your order. With summer heating up, consider new window covering to keep your home cool - you’ll save on your purchase and on heating and cooling costs in your home with the right blinds, shades or curtains. 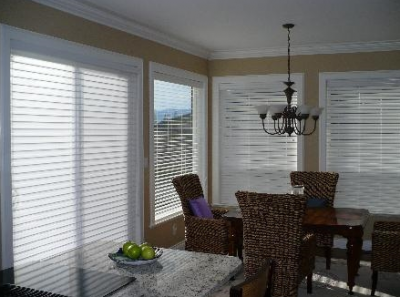 Honeycomb shades are designed with honeycomb-shaped cells, which are designed enhance your home’s energy efficiency by keeping air from escaping or entering your home. Hardwood shutters have an insulating design to make indoor spaces cooler in summer and warmer in winter, keeping your room at an ideal temperature. Window film deflects 99% of damaging UV rays, lessening heat gain and protecting your furniture against harmful UV damage. Contact the design team at Budget Blinds of the North Island and arrange for a free in-home consultation and find the best solution for your home. And all July order will have a chance to scratch-and-save from 25-40%. Visit the showroom at 8 - 2663 Kilpatrick Avenue in Courtenay, call 250.338.8564 or request a free in-home consultation online.